In the two previous rounds the choice of "Game of the round" has been practically obvious for me. As for the third round the only obvious thing is which game is definitely NOT a prize-winner... So I preferred to examine the most interesting moments of the games played in this round and some possibilities left behind the scene. I'd like to remark in passing that in the game Topalov – Leko there also has been a possibility behind the scene – a possibility to struggle. We will not examine this one. 40...¦e3! 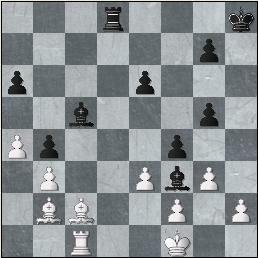 I like this move of Ivanchuk's from the point of view of clearing the position. There were sensible alternatives as well. After 40...b3 41.a6 ¤b5 (also possible is 41...¤f3 42.¦xb3 ¦e1+ 43.ўc2 ¤d4+ (43...¦a1 44.¦b6) 44.ўd2 ¦a1 45.¦b6 ¦a3, but Black is the only one who can take chances here) White is not bound to force a draw by way of 42.¦xb5 cxb5 43.a7 ¦e1+ 44.ўxe1 b2 45.a8Ј b1Ј+=; he can also try to continue playing: 42.ўc1 – though, in all probability, the outcome will still be the same. An attempt to play for mate 40...¤f3!? 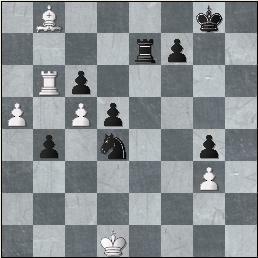 does not pay Black any dividends after 41.a6! d4 (41...b3 - 40...b3) 42.Ґf4! (42.¦xb4 d3 43.¦xg4+ ўh7-+) 42...d3 (after 42...¦e1+ 43.ўc2 ¦a1 44.¦xc6 ¦a3 45.¦d6 d3+ 46.ўb2 white passed pawns are more dangerous, and Black has to be really careful.) 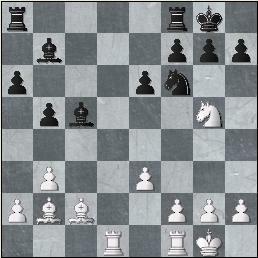 43.ўc1 ¦e1+ (43...ўh7 44.¦xb4) 44.ўb2 and Black is to be thankful for an opportunity to build a draw mechanism after 44...¦e2+ 45.ўb3 d2 46.ўc2 (White also should not go too far: 46.Ґxd2?! ¤xd2+ 47.ўxb4 ¤e4 48.¦b8+ ўg7 49.a7 ¦a2 50.a8Ј ¦xa8 51.¦xa8 ¤xg3 is risky) 46...¦h2 47.¦xb4 ¤e1+ 48.ўd1 ¤f3 49.ўc2 and there is a draw by move repetition. And what if White makes a mistake choosing on 40...¤f341.¦xb4?! ? Looks like it does not lose as well, but he will have a hard time with it: 41...d4 42.Ґf4! 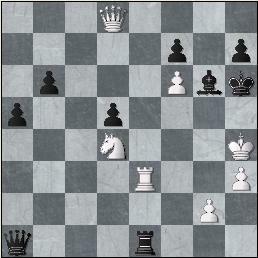 45.Ґf4 White could have continued the struggle by way of 45.¦f4 ¦a8 (or45...ўg6 46.¦f1) 46.Ґc7! (46.Ґe5 ¦xa5 47.¦xf7+) or by a simple 45.¦h4+ ўg6 46.¦h1 ¦a8 47.¦a1 ¦a6 48.ўd3+/= the difference in the rooks' positions gives him a small, probably symbolic advantage. 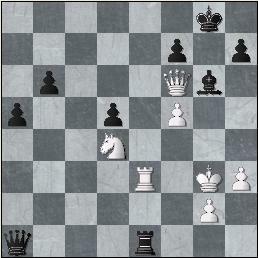 On the diagram the culmination point of the white strategy is shown, the scattered black army is unable to defend its king. 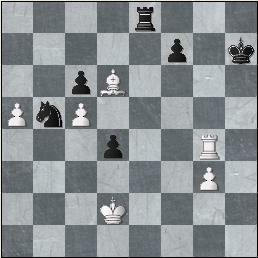 White can win a piece by 34.f5 Јc7+ 35.¦g3 Јd8 36.Јe5+/-, but... it's time to finish Black off! 34...Јa1 35.f5 ¦c1 36.¦e3 On the screen there appears a caption +4.37! 39.fxg6?? I wouldn't like to be in Morozevich's shoes after he has found out that he could have repaid Levon back in kind for Tal's Memorial, and in such a way! 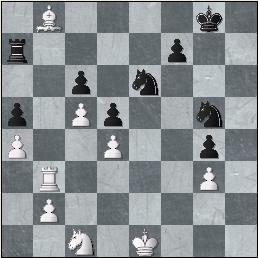 As before the decisive way is 39.Јd8+ ўg7 40.f6+ ўh6 41.ўh4!! It should be noted that the "inhuman" way to win is the only one as well. 17...ўh8! 18.g3?! It was time for White to gradually "wind the play up" by way of 18.Ґxf6 gxf6 19.¤e4 (19.¤xh7 ¦g8 20.g3 ўg7 and the knight is lost) 19...Ґxe4 20.Ґxe4 ¦ad8, even retaining a minimal advantage. 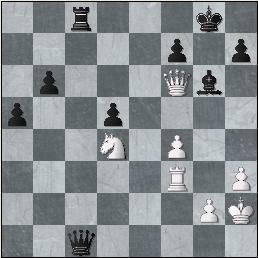 18...h6 19.Ґxf6 hxg5 20.Ґb2 Magnus evades 20.Ґd4, preferring to keep bishops on the board. Funny that my iron partner considers 20.Ґe7?! to be stronger.